Owen and Papa, originally uploaded by bill kralovec. I don’t want this to be a blog version of the movie, “Field of Dreams” but Kevin Costner did get it right with the connection between a father and son that can be generated when it comes to the sport of baseball. With the internet, it is easy to instill in my son a love of the game. I am originally from Michigan and my mother was a fanatical follower of the Major League Baseball (MLB) team, the Detroit Tigers. She listened to or watched all 162 Tiger games every year. Yes, for the foreigners, professional baseball teams do play 162 games per season. From April to October, baseball fans almost daily, can follow their team’s games. This is the first year that Owen got into baseball. He loves to discuss the rules and intricacies of the game. I am only too happy to supply my thoughts and knowledge to his questions. He also enjoys watching highlights and of course, the best thing about baseball, the statistical analysis of all of those plays. It gives us something to talk about every morning, which is not a bad thing. I feel like I’ve done my job as a father to give him an interest in the game. Sports will keep him out of trouble as he goes through those tumultuous years of adolescence and early adulthood. Owen also being a “south paw” or left-handed, gives him a shot at becoming a major league pitcher. A long shot because it takes an extraordinary athletic talent to become a professional, but a possibility it is! But more importantly, it gives us the opportunity to relate to one another. Guys need to do stuff together, and for me, the talks we have while playing catch are the best. This season, 2012, in particular was a wonderful one to be a Tiger fan. They made it all the way to the World Series, losing to the San Francisco Giants. The Tigers in my lifetime have won the World Series twice, once in 1968, which I don’t remember and again in 1984. This is the second time this century (2006 being the first), that they lost in the World Series. They also have the best hitter in the sport, Miguel Cabrera, and the best pitcher in Justin Verlander. It gives us hope they will be good again next year. It is also nice that they have a very old owner, Macedonian immigrant Mike Ilitch, who is spending his fortune on acquiring the best players. He is best known for Lil’ Ceaser’s Pizza chain. 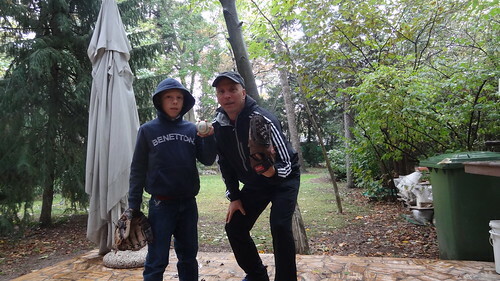 There is a Serbian baseball federation and Owen will be on a team next spring.